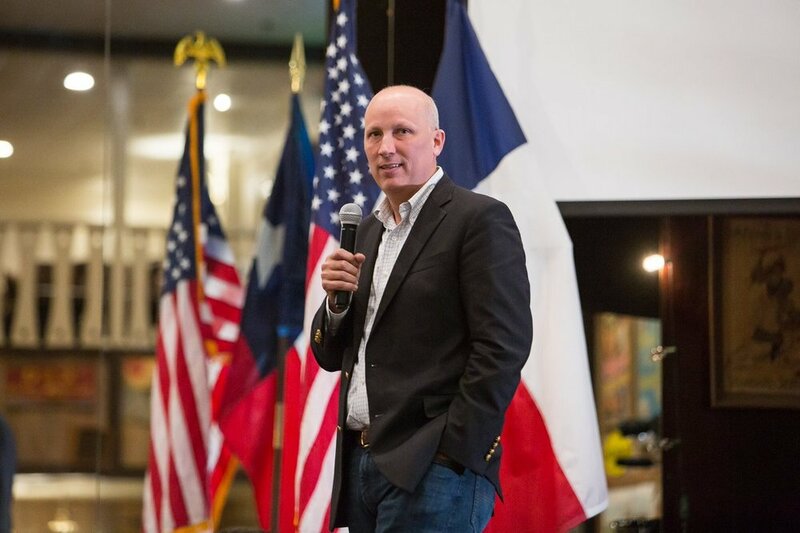 Chip Roy is a Republican candidate for Texas' 21st Congressional District in the U.S. House. Attorney Chip Roy served as chief of staff to Sen. Ted Cruz (R-Tex.) and senior advisor to Texas Gov. Rick Perry (R). He received his J.D. from the University of Texas, an M.S. in management information systems, and a B.S. in commerce from the University of Virginia. Roy is also a former federal prosecutor, serving as special assistant United States attorney in the Eastern District of Texas, serving U.S. Sen. John Cornyn (R-Texas) as staff director of his leadership office, and serving as senior counsel on the Senate Judiciary Committee. He has also been the first assistant attorney general of Texas and the director of state-federal relations for the State of Texas. According to Maddie Diorio, a Republican activist who endorsed him, "Chip Roy is going to Washington DC to be the next Ted Cruz, Mike Lee, Rand Paul and follow in the footsteps of the other great conservatives." Chip Roy lives in Texas. He earned a bachelor's degree in commerce and an M.S. in management information systems from the University of Virginia and a J.D. from the University of Texas. Roy’s career experience includes working as a federal prosecutor and a federal banking analyst. He served as the first assistant attorney general of Texas, the chief of staff to U.S. Senator Ted Cruz (R-TX), and the senior advisor to Texas Governor Rick Perry. Roy served as the vice president of strategy with the Texas Public Policy Foundation. When it comes to immigration, the federal government should have one focus: America. It should first focus its efforts on securing our borders so that terrorists, criminals, and illegal immigrants are not allowed to come and go as they please. That means we need a wall, yes, but far greater interior enforcement to stem the tide of illegal presence. Then it should focus its efforts on designing an immigration system based on American values. Our immigration laws should welcome those who want to work hard and embrace the American dream and way of life – rather than focusing on the interests of well-connected businesses who leverage lobbyists to influence the Washington establishment. The brave men and women in the military must have what they need to defend our country overseas and here at home. For too many years, our readiness has declined as the threats against our national security have grown. I support strengthening our military and ensuring they have both the tools and the rules of engagement that permits them to succeed on the battlefield. In addition, our service members and veterans deserve members of Congress who will unequivocally support them and have their back. Finally, we must do a better job at making sure Washington focuses on its core function so that all active-duty military and veterans are getting the health care and benefits they have earned. We need a foreign policy rooted in peace through strength, where the United States stands up to our enemies and strongly defends our national security interests and supports our allies. After eight years of weakness and appeasement under President Obama, it is critically important that we restore American leadership in the world, and stand shoulder to shoulder with our allies, including Israel, which deserves our resolute support in the most dangerous parts of the world. I was tremendously proud and commend President Trump for his historic announcement recognizing Jerusalem as the capital of Israel and beginning the process to move our embassy to Jerusalem. It is also in the national security interest of the United States to ensure under no circumstances does the Iranian regime ever build and obtain nuclear weapons, and to demonstrate for support the Iranian people who oppose their repressive, terrorist supporting government in Tehran. Healthcare freedom ultimately means being able to purchase insurance tailored to one’s specific health needs. We haven’t had it since long before Obamacare – and THAT is the problem. It is high time we are free in this country to contract for healthcare services and healthcare insurance without government mandates that drive up costs and restrict freedom. “Obamacare repeal” is just a (broken) campaign promise. What we need is healthcare freedom – and that means getting rid of the regulations that are driving up costs. It means empowering healthcare sharing ministries and other avenues to providing more effective cost-sharing among communities. It means radically reforming Medicaid and devolving it to the states with no strings. It means no subsidies for insurance companies. And it means the right to get the healthcare of your choosing without interference from Washington.